If you dread those awkward moments around the Thanksgiving dinner table when the conversation drags, here are a few trivia questions that can get things going again. • How long have Americans celebrated Thanksgiving? This is a trick question. Although the tradition extends back to the days of the pilgrims at Plymouth Rock, Thanksgiving didn’t become a national holiday until President Lincoln declared it such in 1863. • According to Pilgrim etiquette, which fork should be used for turkey? The Pilgrims didn’t use forks! 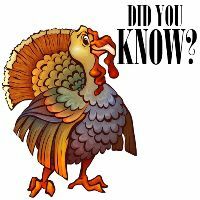 The instrument was introduced by Governor Winthrop of Massachusetts 10 years after the first Thanksgiving and didn’t gain popularity until the 18th century. • What’s the connection between Thanksgiving and football? In 1934 G.A. Richards purchased the Detroit Lions. In an attempt to build up the team’s fan base, he scheduled a game against the world champion Chicago Bears on Thanksgiving Day. The game sold out and was also broadcast live on radio. The rest, as they say, is history. If you need more trivia questions, you can find them here! November means Thanksgiving dinner for many of us - and that means spending plenty of time in the kitchen. Here are five common mistakes homeowners make when remodeling their kitchens. 1. Open Shelving Overload: Having open shelving is a somewhat new trend, but sometimes homeowners have too much of it. Not everything needs to be on display. Use it sparingly to highlight certain items. Too much “openness” makes things look cluttered. 2. Stainless Saturation: Stainless steel remains very popular for kitchens. But using too much stainless steel robs your kitchen of warmth and can make it look like a morgue! 3. Outlet Shortage: It’s easy to think that you have “plenty” of electrical outlets in the kitchen - until you actually want to plug things in. Make sure you include plenty of places to plug in. 4. Trash Happens: Let’s face it: Kitchens generate a fair amount of trash. If you don’t plan for a place to hide it away, it’s going to be out there for everyone to see. Plan a place for trash to live. 5. Inadequate Lighting: Your kitchen needs different kinds of lighting. Make sure you plan for task lighting and for ambient (mood) lighting! Forget Long Black Friday Lines - This Is a Bigger Problem! • Don’t pour fat, grease, or cooking oils down the drain. Use paper towels to wipe grease from pots and throw them in the trash. • Keep fibrous and starchy waste (poultry skins, celery, fruit & potato peels) out of the garbage disposal. • Run your disposal before you put food into it instead of waiting until it’s full. • Wait 15 minutes between showers to allow slow drains to clear.